Knowing dividends reduce shareholder equity helps explain how they’re reported. Note: The basic information in this article is augmented by details provided in the footnotes. What Is The Basic Purpose Of An Investment Account Statement? An investment account statement provided by the custodian is primarily an inventory of ownership. It lists investment holdings at the end of the reported period. It also itemizes transactions during the period, detailing how holdings changed over time. A statement is an ownership inventory, not a performance report. What are my holdings as of the end of this period? How did my holdings change from the previous period? However, a statement is not a performance report1, even if it contains a so-called “Performance Summary”. This is where I think many people get confused. Where Do Cash Dividends Come From? A publicly-traded company’s common shareholders hold claim to the equity left over after all other obligations are paid, hence the term “residual equity owners”. A growing company typically reinvested its net earnings or cash profits back into the business. These accumulated, reinvested earnings are noted on the company’s balance sheet as retained earnings and comprise total shareholder equity2. Cash dividends paid to shareholders are deducted from the company’s net earnings (cash profits). The remainder is reinvested back into the business and is reflected on the balance sheet as retained earnings. Dividends reduce shareholders’ equity. Dividends are NOT FREE! The previous two paragraphs are key to understanding the nature of dividends, how they affect account statements, capital gains, and performance reporting. Cash dividends are carved-out from net earnings. Therefore, dividends reduce the cash profits which otherwise would have been reinvested to grow the business. This reduces a company’s shareholders’ equity. This is why the stock price is reduced by the exchange preceding the ex-date in the amount of the dividend. I covered this topic in some detail in Understanding Dividends. Dividends are NOT FREE! Most investors are aware that dividends and capital gains are taxed differently both in terms of timing and tax rate. The company is taxed on net earnings including any dividends paid. The shareholder is taxed (again) on the dividend, and separately on capital gains distributions. How Do Cash Dividends Affect Statement Reporting? Like a company’s balance sheet, the summary includes the reported period’s beginning and ending market value. And like an income statement, it summarizes sources of income such as dividends and interest, market appreciation or depreciation, etc. For example, assume net market appreciation for the period was $900 with zero dividends. What effect would $100 in dividend distributions have? Market appreciation would be $800. Why? The $100 dividend came out of shareholder equity, reducing market appreciation to $800 by the market’s aforementioned automatic price adjustment mechanism. Your total gain remains $900. The holdings section lists each security in the account at the end of the period. As a minimum, the list provides the symbol or CUSIP and the quantity held3. It may also provide other information like cost basis, the closing price, indicated market value and unrealized capital gains. Dividends are not some magical source of extra income for compounding through reinvestment. Assume that 100-shares of stock closed at $50 for a total value of $5,000. What if this stock had paid a $1-per-share dividend? Holdings detail would adjust price to $49, reducing total value to $4,900 and unrealized capital gains by the $100 dividend. The summary would show $100 more in dividends and $100 less in capital appreciation. The total value4 contributed by the holding would still be $5,000. The transactions section itemizes all activity during the reporting period. Transactions include changes to security holdings such as buys and sells, cash contributions and distributions, dividends, interest, taxes paid, etc. In our previous example, transaction detail would credit the $100 dividend to cash. If it was automatically reinvested, a stock purchase of $100 in value would be listed separately. Reinvesting increases both cost basis and indicated market value equally by $100, leaving total unrealized capital gains unchanged5. Custodial investment account statements are primarily an inventory of holdings, not performance reports. 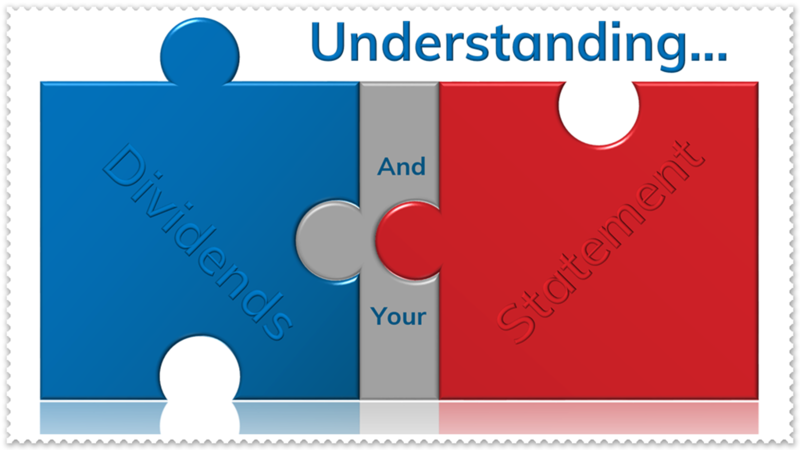 Dividends affect statement reporting due to their nature and tax treatment. Dividends are not some magical source of extra income for compounding through reinvestment. They would have been retained and reinvested by the company but for the fact they were paid out. This is why faster growing companies typically pay less if any dividends. Deliberate seeking dividend payers can be an inefficient investment activity. Deliberate seeking dividend payers only to reinvest back into the same company can be an inefficient investment activity regardless of tax consequences. There are better reasons to have dividend payers in your portfolio. At Coherent, we choose to reallocate dividend distributions where the portfolio allocation dictates, rather than automatically reinvest them. This has an added benefit of helping to reduce the complexities of determining cost basis at tax time. Performance is an entirely different field of reporting than what statements are designed to do. Performance takes into account many factors, including the amount and timing of returns, netting out cashflows. The result is a theoretical measure of return, often reported alongside a hypothetical benchmark appropriately designed for the account’s specific investment strategy. Stockholder’s equity per common share is reduced by dividends paid as follows. Book value per common share equals reported stockholder equity divided by common shares outstanding. On the balance sheet, stockholder’s equity includes end of period retained earnings. End of period retained earnings equal beginning of period less dividends, divided by weighted average shares outstanding. An investor owns shares of a security, NOT dollars. If 100-shares of XYZ last traded at $50, you own 100-shares and NOT $5000 of XYZ. Barring trading or corporate actions, the quantity owned remains constant, while price changes. Statements often report a closing inside or best “bid” (for securities held long) to provide an indication of the holding’s value. This indicated value can only be realized by actually (a) selling your shares, (b) in the quantity available at that price and moment in time, and (c) only on the exchange on which the bid resides. If all the owners of XYZ placed a simultaneous sell order, they would not all get the reported inside bid, unless by some miracle all buyers simultaneously bid the same price and quantity on the same exchange. In the real world, prices drop until the last share has been exchanged. Therefore, you do not own dollars of a security, but shares. Although the total value contributed by the security has not changed, the distributed dividend has reduced the holding’s base value upon which future gains will be measured, namely from $5000 to $4900. For instance, a future 10% market increase would produce $490 of unrealized capital gains, rather than $500 had the dividend not been paid. To offset this effect, the investor may reinvest the gains. But in practice, the reinvested cost price may be different due to market movement, and the total dollars reinvested will be lessened by taxes. If the dividend had not been paid in the first place, the company would have reinvested it in the business as part of its net earnings. Capital gains exclude dividends indirectly by reducing market value. Dividends are accounted for separately from capital gains because they (a) are a different type of income source, (b) are taxed differently, and (c) compound differently if reinvested. Next Insight »Who’s Really Advising You?